I read an article today that discussed the term “binge watching” being added to the Oxford English Dictionary. Back in the day, I could binge watch with the best of them. 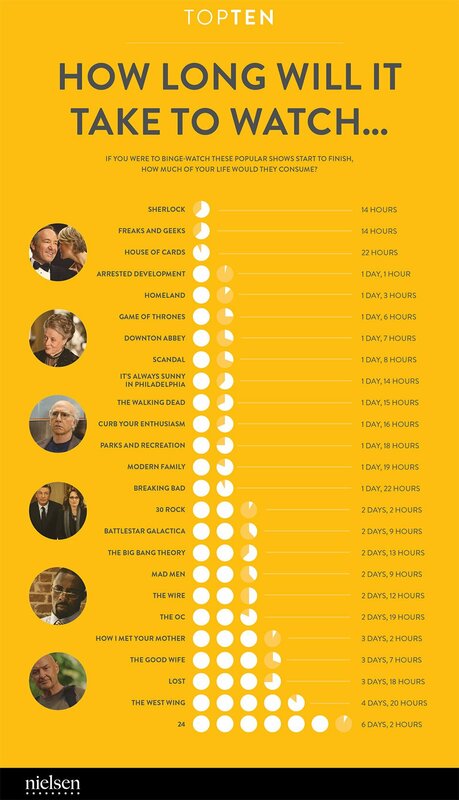 I may have watched the first season of 24 in approximately 24 straight hours. I watched the first season of Mad Men on such a binge, that I had to take a break because my stomach hurt from watching them smoke and drink so much. But these days, we don’t have as much time to sit and watch 6 hours of our latest addiction on a Saturday. It is the tenth anniversary of the OC. You can read more awesome things about that here, here, here and here. I loved the OC. It was, still is, a great show. I consider myself a bit of an expert on teenage dramas and this one was a step above the rest. But it wasn’t just the witty banter, the great music, the eyebrows or the cage fighting that keeps the OC so dear to my heart. The OC has played an important role in A and my relationship from the start. A and I met in December 2004. The OC began in the year earlier and I did not watch. I was in law school, had no time for such silliness. I heard others talk about it, but I think I was watching important things like “For Love or Money.” Anyway, we met in December in South BEnd and then I returned to VA for Army training and A went back to OK for the real Army. We began to email daily and A’s love of the OC became clear. I don’t remember when I started watching the OC or how many episodes of the second season I saw during that early part of our relationship but I clearly remember watching “Rainy Day Woman.” (More on that later.) I wanted to like the things he liked and since basketball teams were out of the question, teenage dramas seemed like a good place to start. As our relationship progressed, I knew A like-liked me when he let me borrow his OC season one DVD set. He couldn’t break up with me while I had that, right? He would inquire as to my progress in our nightly chats, sometimes encouraging me to stop talking to him so I could finish an episode and be able to talk to him about it. He couldn’t wait for me to enjoy this thing that he had enjoyed seeing for the first time and enjoyed (at least I am pretty sure he did) reliving it through my eyes. Even though the OC ended, our love of it (and all teenage dramas) continued throughout our relationship. At our wedding celebration, we didn’t have table numbers, but instead tables named after our favorite teen drama characters. Some of our friends were lucky enough to sit at the Sanford Cohen, Julie Cooper Nichol Bullit Atwood, Caleb Nichol and Pancakes tables. The time we spent writing the bios that went along with each placard was probably our favorite wedding preparation moment and one that really made our wedding “us”. Years later when I was on hospitalized bed rest while pregnant with Lila, A brought the DVDs to the hospital so I could pass the time with some old friends. We made it through two seasons before the three weeks were up and we brought our little girl home. The song “California” still sings out of my cell phone every time A calls. And the end of season two brings me back to Rainy Day Woman. For me, Rainy Day Woman is not just my favorite episode of the OC. For me it is where the true fans were separated from the pack. You had to really get what the OC was about the enjoy it. You had to understand their worship of pop culture and Seth’s nerdiness and Ryan’s well, Ryan-ness to make it all work. You had to see that the kiss wasn’t just a cheap rip off of the summer blockbuster, but really the coming together of what made things great. (Considering Champagne Supernova one of the greatest songs of all time contributes to the love of this episode as well.) The first time I watched it with friends, many didn’t get it. Some decided it was dumb and they didn’t want to watch, anymore, or that the kiss was out of place. But A and I saw it the same way. The OC masterpiece. The one that said if you don’t get it now, you should totally leave before Ryan starts cage fighting. Perhaps the greatest sign of our compatibility. So for me, the OC isn’t just a great show and the tenth anniversary isn’t just a nostalgic look at something I once loved. It is something that may seem superficial to some, but that means a lot to the story of “us”. I’ve found that maternity leave can be stressful for me because I have too much unscheduled time. I know that is the point of maternity leave – taking time to adjust to the new life we’ve entered. But as one who is used to needing a schedule to make life with a two year old and a full time job and the requirements of daily family life work, entering a lifestyle without a schedule is hard. Knowing that this caused anxiety for me during LC’s maternity leave, I tried to better prepare for it this time. Even though I felt like I needed a schedule, I knew I would also need some time to relax. But this can be a slippery slope – on Wednesday Lucy and I dropped A and LC off at work and day care, then ran errands. We came home around noon, I made lunch and then climbed into bed to feed Lucy. She fell asleep and I worked on my laptop in bed. Two and a half hours later we were still in bed. Sure the rest and doing nothing was nice, but realizing it was 3:30 and I hadn’t done anything around the house was stressful to think about – not to mention guilt about doing nothing for almost 3 hours. So I need to find the balance between an unattainable to do list and staying in bed all day. Today we got up and did our drop offs and then I worked on a few projects around the house. We took Cal for a walk and I finally finished putting together the birth announcements. It felt good to have accomplished things. I’m trying to find one thing to get us out of the house each day – for now we will do Mommy & Baby yoga on Monday, Little Peppers (with LC) on Tuesdays and Weight Watchers on Wednesday (baby fat doesn’t disappear on its own I’ve found). I’m hoping to find a sitter to come once a week to give me a few hours out of the house without Lucy – for things like hair appointments or actually working out without a baby in a Moby wrap. Last Friday A and I had a lunch date and it would be nice to continue that trend. With all these plans and to dos, I know we still need some downtime (if for no other reason than Lucy still gets up twice a night). With more plans and structure to our day, I hope that climbing back into bed to watch something silly on the DVR (ok, not silly, American Idol which is awesome no matter who the judges are and I do not care what you say. I love Nikki Minaj) won’t seem so self-indulgent. Somehow Lucy is already 5 weeks old, which means maternity leave will end before I know it. I know I’ll miss this time and wish I had more to spend just hanging out and being with her and LC, no matter how we choose to spend that time. Whether it was the Pacific NW influences, or just our own parenting style, A and I decided that LC would not watch television. ** But like all hard and fast parenting decisions, you have to make compromises. As LC’s hair got longer, the getting ready in the morning has gotten more difficult. She has to have her hair pulled back each day or else it will get in her face and drive her crazy. While she hates having her hair in her face, she also hates having to sit still to have her hair done. In a moment of frustration one morning, I pulled out my iPhone and pulled up an Elmo video on YouTube. I didn’t know if it would work because LC doesn’t watch videos and truly has no idea who Elmo is. Both to my delight and horror, LC was instantly hooked on Elmo. It may have taken her three months longer to say Momma than it did Dada, but it took no time at all to learn Elmo. “Al –mo?” she asks every time she sees my phone (and now iPad after the most recent cross country flight.) Her favorite is Elmo and the Ducks. The adorable side of this is that she thinks Elmo is a cat and will meow at him. The other side is that I feel pretty guilty about it. 18 months in and I’ve allowed my child to buy into one of the biggest toddler commercial entity out there. She hasn’t asked for Elmo sneakers yet, but I can see it coming. And her 2nd birthday? Oh, I’m sure I’ll have to seek guidance on this Pinterest board. We still won’t allow LC to watch things (other than the caveated items below) on the television – because just as she freaks out for Al-mo when she sees my phone, we don’t want her to insist that Elmo be put on the television every time she passes by it. There are definitely worse things that LC could be excited by and in the big scheme of things, it is not surprising that around 18 months Elmo came into our lives. I just thought we’d avoid the Elmo trend, or at least watch it enter our house because of outside influences like day care – not that we would willingly open our door to watch him boogie on in. The good news is that I can get LC to sit still for approximately 2:39 each morning as I struggle to do her pigtails. The bad news is, I have to listen to this while I do it. **The caveat to this is of course sports don’t count. LC was watching NCAA basketball before she left the NICU. Mostly football and basketball, a little baseball. She loved the Tour de France (she has a things for bicycles) and dressage in the Olympics blew her mind (horses! on tv!). Tennis does not seem to interest her much. While it remains an unconfirmed rumor, it appears that the next season of Top Chef will be filmed in Seattle. A and I have been Top Chef fans for a while. I loved the first season almost more for the San Francisco locale than the food (A was attending school in Berkeley at the time), but I soon grew to love the food. While the past couple of seasons have not been as great as others, I have high hopes for Seattle Top Chef – if for no other reason then they have been filming blocks from my office. As a long time fan of the show, I have a bit of an idea of how the show works. Being a Seattleite who likes food, while not try to guess what some of the challenges would be. – Pike Place Market – the easiest to guess (and basically confirmed that filming has occurred there) is shopping for ingredients at Pike Place. Lots of local favorites, pretty colors and delicious foods – not to mention lots fun shots running through the market and catching some fish. – Gates Foundation – the Gates Foundation works to help people around the world to live healthy and productive lives. Their international flair will be the perfect place for an around the world challenge – chefs assigned countries/regions from which their cooking style will come. Or you could take a more “self-aware” approach and perhaps make the chefs cook with rice – the meal most people around the world eat for dinner each day. – Cafeteria challenge – there are many large companies with large corporate cafeterias (Microsoft, Amazon, GroupHealth). Why not take over a corporate cafeteria – cooking large scale food for people to enjoy. Perhaps the only issue with this is that these cafeterias are pretty high end to begin with – I’ve eaten at the Amazon Garage more than once and the daily portions of Beecher’s Mac and Cheese is not the only highlight. – Sports – Sure, it would be great if Top Chef could herald in the arrival of an NBA team, but short of that, Seattle-ites love their football club. A Seattle Sounders challenge – park food, soccer foods, I haven’t quite figured out the angle here other than Seattle likes soccer. And scarves. – Cardboard box challenge – fans of Amazon.com probably have a living room or recycling bin that looks like ours – filled with the familiar brown box. I think the chefs could do a Chopped style challenge – finding ingredients in a brown box and then creating a meal from it. – Restaurant Wars! – though always such a train wreck, Restaurant Wars is always a favorite episode of Top Chef fans. While the challenge itself always follows the same rules, I propose that dueling Tom Douglas restaurants would be used for the locations. – Book challenge – Ok, so Amazon is an easy suggestion but it certainly helped to put Seattle on the map. A literary inspired challenged – food inspired by authors, novels, it is pretty easy to pull one together. – Grunge – I’m not entirely sure how one pulls food and grunge together, but I think Seattle would be the place to do it. Music inspired? Maybe Kurt Cobain had a soft spot for haute cuisine? A broader music challenge – pulling in Jimmy Hendrix, Nirvana and newer acts like Modest Mouse. Challenge of course could take place at the EMP. – Organic – Oregon Tilth sure loves Seattle and is a big deal in the food world up here – sustainable, organic, local – those words are thrown around in just about every restaurant opening announcement. It would be hard to feature Seattle and not involve the organic movement. – The obvious choice. Ok, so Seattle probably is probably known for coffee more than anything. A Starbucks challenge may be the only thing as sure as the Pikes Place challenge. Chefs could develop the new bistro box, a new pastry, a new favor combo for drinks – or simply cooking with coffee. If you stop and think about it for more than a few minutes, there really are endless possibilities. Seattle is a pretty great city, especially for food and hopefully more than those of us who live here will know that after this season of Top Chef. Last Friday A and I snuck out of work early and went to the “secret” Shins show in downtown Seattle. A combination music lovers/Starbucks promotion concert by one of our favorite bands was too good to pass up. We were front row (that’s press or something in front of us in the photo) and the concert was fantastic. Music is probably the biggest thing A brought to our relationship (for those wondering I brought B-Cat and American Idol.) A loves music (or what he feels is good music) and wants to share it with me and LC. I had discovered the Shins as most of America had, in the movie Garden State, shortly before A and I started dating. On our third “date” we saw The Shins in concert at a roller rink in Oklahoma City. (Ok, I can’t prove it was a roller rink, but I can’t prove that it wasn’t.) The memories of that concert in Oklahoma are ones that I have always treasured from our early relationship. This random, perfect Friday afternoon concert when we were able to be two people in love, loving the Shins again, without worrying about babies, beagles or any other responsibilities was pretty wonderful. So thanks to Corey the VP of Starbucks Marketing and all the others who let A and I pretend that we were that silly couple in a OK roller rink again, much appreciated by all. PS – Buy the new Shins album. It’s pretty fantastic.